Nissan is moving forward with its innovative solid oxide fuel cell technology. The Japanese automaker recently revealed this new technology and has now incorporated into a new prototype vehicle. 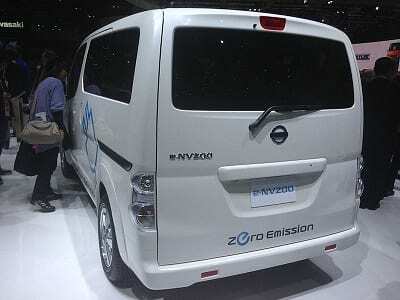 The company has modified and existing e-NV200 van so that it can run on electrical power. This power will be produced by the solid oxide fuel cell. The fuel cell consumes bio-ethanol in order to produce power and the system removes the need to store hydrogen under high pressures. The new fuel cell system will still need hydrogen in order to generate electrical power, but the vehicle features a small chemical processing system that can generate hydrogen fuel while in operation. The vehicle will primarily be powered by ethanol or an ethanol-water blend. Nissan notes that the high availability of ethanol makes it a very attractive fuel for transportation. Unlike hydrogen, ethanol can be produced at relatively low cost and with little energy expenditure. A solid oxide fuel cell can consume ethanol to generate electrical power in an efficient manner. Nissan has shown interest in fuel cell technology, but has been slow to embrace these energy systems in the past. The company already has a strong presence in the clean transportation space, but has primarily focused on battery technology to power its clean vehicles. The company has been experimenting with a solid oxide fuel cell system for some time and believes that this technology may soon become practical for vehicles that would be released in the future. According to Nissan, its modified e-NV200 is capable of traveling some 373 miles before needing to be refueled with ethanol. The hydrogen that the vehicle generates during operation is used to extend its efficiency. The automaker has expressed praise for its new fuel cell system, predicting that it will be ready for commercialization within the next ten years.